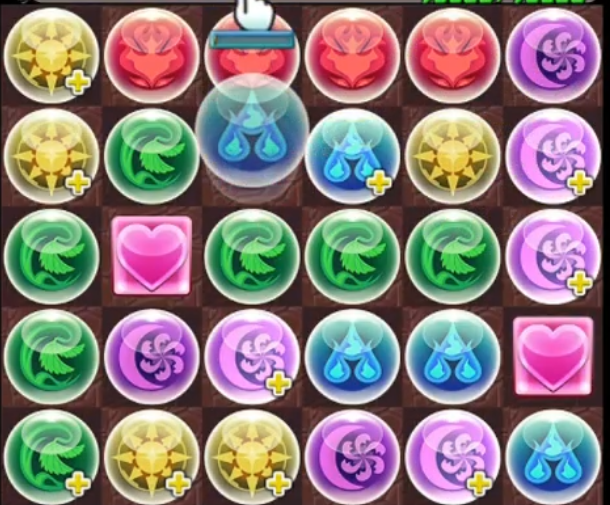 A standard board in Puzzle and Dragons is 6×5 which yields 30 orbs and a maximum of 10 combos. However, it is very unlikely you will actually have perfect board distribution to hit those 10 and will more than often settle for 7-8 maximum combos. When approaching any board, it is wise to count the number of orbs of each colour to give yourself an idea of what the optimized board can yield. For example, if you have 5 dark and 5 light orbs, those two colours can only yield a possible 2 combos. Thus, you are looking for multiples of 3 when counting. This may seem basic, but is easy to overlook when in a pressured situation. You can relabel each section to suit your preference along with having the large horizontal section be at the top etc. Regardless, this is how I mentally plan out a board by determining whether or not I want my Section 1 at the top or bottom. This is because in Section 1, you want to make 4 combos that are in a horizontal fashion. Thus, you are looking for closely grouped colours that are readily matched in this respective pattern. There is method behind my madness and the reason why you only make two rows of horizontal matches is because it helps facilitate easier matching. If we were to use the middle row of the board for another horizontal match (presently made 6 combos), we would be left to play around with a 6×2 board which will force you to make additional horizontal matches and this becomes terribly difficult to do when as moving around in that vertically restricted space will most likely result in fewer combos overall. As such, if you are left with at least 3 orbs in each direction (horizontal and vertical) you are much better able to form combos as you can go in either direction without fear of breaking up a previous combo. 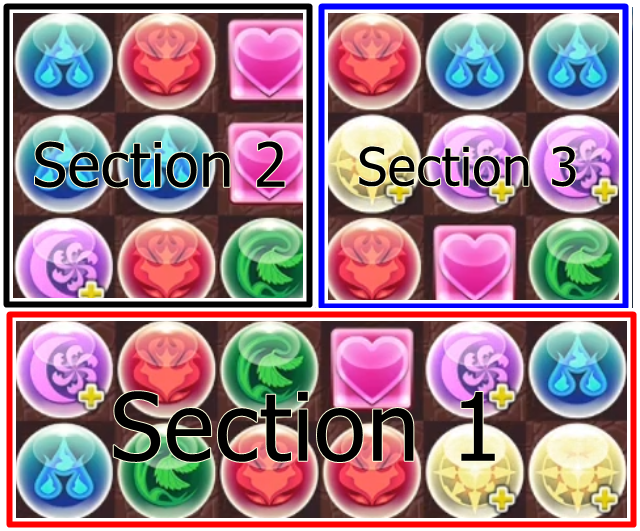 Generally speaking, you will be left over with 6-9 orbs based on if you were able to match 7-8 combos and these will tend to be collected in Section 3. If you are fortunate enough to have two of a particular colour, try your best to place them together in the hopes that a matching orb will skyfall into place. You have a 1/6 chance of this occurring (6 different elements) but why not take all the help you can get. In theory you should try and place them horizontally and have each end open to grant you a 1/6 chance of skyfall happening twice. Cascading is a technique used to help facilitate skyfall matches by having combos on your board match in a staggered fashion. These delayed combos are intentional and by having new orbs fall down in a staggered rate, you increase the chances of new orbs falling down to match with existing ones. While this has no effect on no-skyfall leaders, it can be used a means to help facilitate combos as you may require less overall steps to achieve. 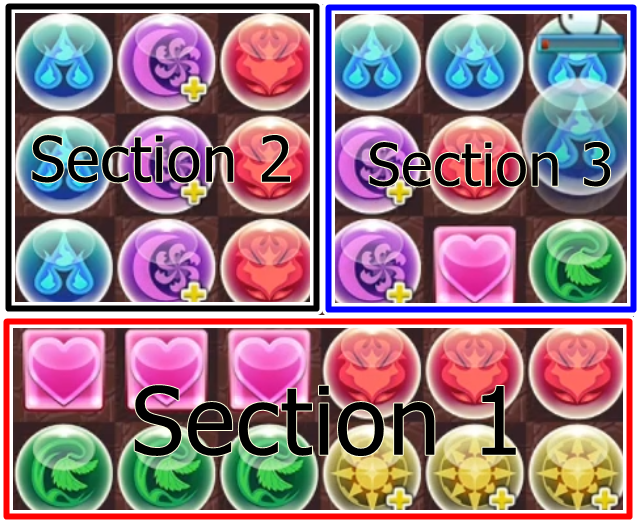 The above image showcases how the cascading light orbs on the leftmost column will trigger several additional combos. This will result in a staggered rate of orbs being cleared with grants the opportunity for additional matches. If you wish to read more about Cascading, please refer to my guide HERE. I try my best to create accessible content that can be consumed in both a written and video format, but when it comes to a combo guide, it is best to see it play out in action. Furthermore, when practicing on your own, you should always go into Endless Corridors first and vary the amount of Time Extend until it becomes akin to what a normal team would have. Lately, I have been playing a great deal of Anubis on my Twitch stream and it is another great medium for learning combo skills. There are many different ways to approach solving a board and everyone will have their own personal preferences and strategies. The techniques I use are not the only way to go and view them as a supplemental way to solve a board. Awesome! What makes this really great is that you put a name to what I realize I have been habitually doing. That is, I try and do a couple horizontals, then whatever I can get. But to specify parts of the board, and to work vertically, you can get a lot done. What has been hard for me is what to do with the leftover. I just try and combo left to right or right to left. But by leaving all the orbs in one section, you don’t sty my yourself or get locked in a corner as easy. thank you! Due to the new 7c awakenings, I’ve gotten a lot better at comboing simply because I’m trying to trigger bonus damage, but if I fail it’s not like I die. So there’s more leeway for practicing. Cross leads (I use Aizen) require some additional tricks to get higher combos, but even there I’ve gotten to 5-6 combos pretty regularly with crosses. My Anubis team has 2 Diaochans, which is just crazy for practicing and doing killer damage. One thing that’s always bugged me about PAD’s UI is that it is usually VERY difficult for me to read that little timer bar on the finger cursor, even playing on a tablet… pretty sure it’s a psychological thing, I can’t look away from the orb I’m immediately moving. So when they added the “hold to see how much time” feature, it was a huge boost, since I could at least do some “one-one thousand-two-one thousand…” counting to maximize my time usage. Of course, now we’re in crazytown, with Awoken Raphael… Ever since no skyfalls was a thing, I thought they should do a leader with a massive damage boost if you clear the board… with Raph, they added a bit of a fudge factor to it (big boost for 4 or less orbs remaining), so I’m super interested to see how that plays out. Been waiting for something like this for a while. For people with no system it sheds some light on what other puzzlers are doing to get the most out of boards and combos. Looking forward to any more of these types of posts in relation to ‘no skyfall’ leaders. Glad you enjoyed it! What other topics did you have in mind in regards to combo-style guides? Great work, definitely much appreciated. Having been recently graced with Anubis I realised I had to step up my combo game after somewhat slacking on it with my many heart cross leads. So far I struggled doing the ‘Section 1’ approach on the whole board, often falling short of those crucial Anubis 8+, so I’m very eager to try out your technique. Many thanks and happy puzzling! On a side note, I’d personally really appreciate a similar guide for general tactics to tackle 5×4 and 7×6 as well. Just keep at it and you will start optimizing more boards! You are very welcome and best of luck in your own puzzling adventures! What stylus do you use? I’ve used the cheap foam type, but it eventually sticks after too much use. I also have an Admit Jot Pro, but there are times when it has stopped registering a connection in the middle of a solve and I dropped the orb. Hi, mantastic, can you show us how to combo while doing TPAs of particular colour at the same time? TPA teams Like Haku for example, any hint would help, thx! Big thanks for the guide. Hopefully you recovered well from your med-treatment. I wish you all the best! I’ll leave a few questions if you find the time 🙂 Like many, i recently got Anubis (pcgf ofc) and 2 diaochan and have them finally evolved, partly skilled and try to get in the extreme comboing. Matching 6-7 looks ok, i achieve 8 sometimes for now, but that is the max, skyfall excluded. If skyfall happens it is extreme ofc. From your experience, is 8 maybe the goal to set up for the mental picture, even if more is even possible? Seems i loose valuable time neatly arranging sectors 2 and 3 to left and right border. Related to that, with how much time do you personally safely achieve 8 combos? If i add 2 seconds maybe that should be achievable at lesser talent. I understand Anubis is an endgame leader, which at higher difficulty levels and his rather low HP it’s kill or die every floor, so basically his active and the subs are there mostly to help if he screws up, right (+ TE)? With that said, what’s his endgame viability with no utility of importance (delay, guard-break, other). Hi Mantastic, I wasn’t sure where to post that question. But here it is. What kind of device you, Pancake and Momtastic use. I’ve been playing for around 16 months using a Samsung tablet and phone and I get a lot of lag and even orbs that drag or refuse to move all together. I used to match with my finger but change for a supen stylus to see if thing could improve a bit. Thing are about the same. Was wondering if a iOS device work better than Android for pad. I need to get a better understanding of team building & the different types .I have been playing a while but I have yet to be able to clear most of the descended dungeons . PAD is both team building and combo-ing skills so it comes down to which aspect is giving you more trouble? For your current team, who are you using?